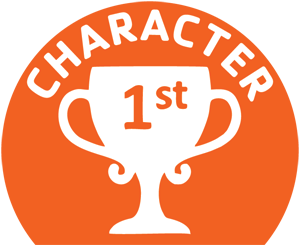 What is Character 1st all about? High School athletics and sports participation is part of the fabric of the American culture. It is, and has been, a cornerstone of the high school experience. In smaller schools, participation in high school sports can be 60-90% of the student body, while in larger schools 40-55% of students are engaged in an athletic pursuit. When you consider that only one team will hoist a championship trophy at the end of each season--or that only one team will win the conference or district title--sustaining a winning program is hard work. Character is the cornerstone of successful teams and athletic programs, and Character First will emphasize values that you identify as important in your program, your school, and your community. Character First will help guide your coaches and administration into establishing values that will help propel your athletic program to greater heights, while helping to educate your coaches on the importance of how players treat the game and those around them. We are not only teaching young men and women how to play the game we are coaching, but rather we are preparing them to be good citizens and good role models for life. We are trying to improve our respective corners of the world by producing strong young men and women. The presentation is designed to take place in one day, with an optional half day that would include athletes. The one-day event brings in the entire coaching community at the school and identifies your core values. Once the core values are identified, the next step will be the process of implementing those values across all the athletic programs in your school. The presentation will help you plan for educating your student-athletes to hold each other accountable to those values, while recognizing potential roadblocks along the way. It is important that every varsity head coach is in attendance. Part of the process, in developing "your core" will be the buy-in by all the stakeholders. There will be resistance by some, but going through the training process will help move them to your end goal, which is to improve your entire athletic program. The Athletic Director will be the key to making this happen, and the success of the Character First implementation will depend on the AD's ability to hold coaches accountable in addition to his or her zest and enthusiasm for the program. Every coach--junior varsity, assistants, freshman, volunteers--should be invited to be part of the training day, this is a coaching community mission, and the more coaches that are in attendance, the greater the overall impact will be. Support from administration is imperative to sustainable success of the program. Administration needs to be aware of what is taking place, and their support is essential to success. They all communicate with parents, staff, and students, and as such their understanding of the Character First program is crucial. With the oftentimes high turnover rate in the athletic director position, administrators need to have an understanding of the Character Firt program in order to keep it relevant and at the top of their list during a time of transition in the athletic department. (Optional) It may be beneficial to have a board member in attendance to help talk about your message. School budgets almost always attack athletics, and having a board member who understands that athletics are not just about W's and L's could be a great benefit. 4. Parent or Booster Representative: ​(Optional) Similar to the board member, a supportive parent group/booster group can help with funding and promotion of your Character First program. 5. Community Representative:​ (Optional) Bringing in an influential community representative can help spread the word about the program. The school is part of a greater community, and the representative will see this program as a great way to improve future employees and citizens of the community. 6. Media: ​Working with the local media will help with the success of the program. While wins and losses on the field or court are important, having the media understand that you are working on the wins and losses that your student-athletes experience in daily life could have great benefits to the success of your program. The ideal setup would be a one-day coaching seminar in the summer or on a Saturday without a contest. It is an extra day for your coaches, assistant coaches and administration, so some creative thinking may be needed to entice them to come. Of course, we would expect our coaches to want to be at the event, but we are asking for another day away from families for a group of people that are already underpaid and coaching simply for the love of their game or their commitment to kids. I have provided a sample schedule below with some small incentives. 8:00- 9:15 - Welcome, Intros; The importance of a character-based athletic program. What is your Brand? 9:30 - 11:00 - Determining the values important to your athletic department and defining those brands. 11:15 -12:15 - How to teach those values to your teams and your coaching staff. 12:15 - 1:15 - Lunch break (School/boosters cater in pizza/subs something for lunch so coaches do not have to leave; could also cut 30 minutes off the schedule and get them out earlier if on-site). Student leaders 9:00am - 11am (or evening 6:00 - 8:00pm) - Coaches identify, prior to the event, juniors and seniors who will be leaders for their upcoming season. Those students are brought in and educated on the Character First core values identified by the coaching staff the previous day. These students will help to model and teach the values to the underclassmen as you roll out the program. The students selected are captain-material kids, students that are already good role models for other teammates.